The BBC is in the process of launching 'Correspondent Pages' which will aggregate all the content of a BBC correspondent on one page. 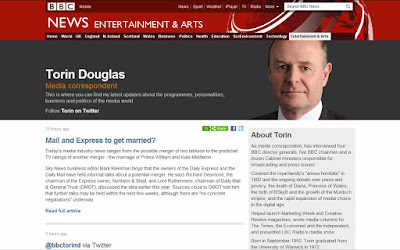 They will replace BBC News 'blogs' and pages for Peter Hunt, Torin Douglas and others have been running in stealth mode since the end of March. The change to the new format is explained in a blog post published today by News Blogs Editor Giles Wilson. He describes the move "as a pretty fundamental reinvention" of how the BBC's news "blogs operate". The pages will collate all the content correspondents produce, including their articles for the BBC website, their radio and TV reports and their Twitter feeds. The new Correspondent Pages were indicated as part of a broader set of changes outlined recently by the Editor of the BBC News Website, Steve Herrmann. 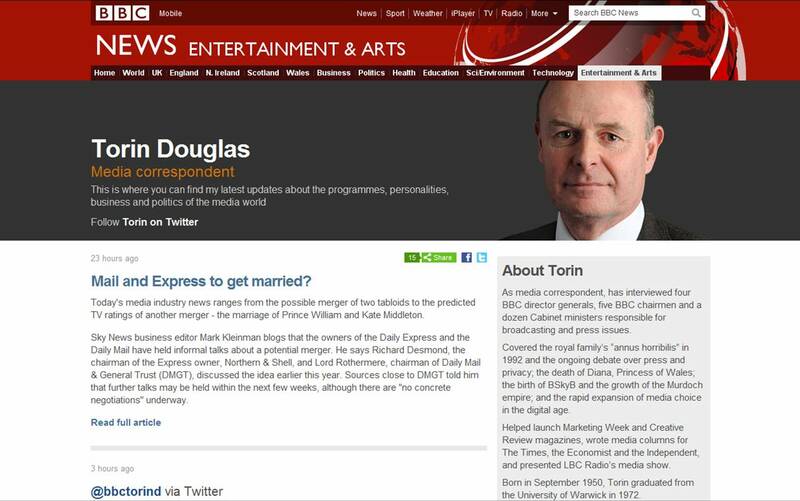 The BBC is not going to call these new pages 'blogs' and BBC blogger and Northern Ireland Political Editor, Mark Devenport, has already said farewell to his old blog format. In a post flagging up his switch to the new format entitled 'Devenport Diaries RIP', he said he "fought long and hard" for the retention of his alliterative blog title but the "powers-that-be wouldn't budge". His Devenport Diaries blog is now archived here. Devenport has been using his new Correspondent Page to report on the recent elections in Northern Ireland. The BBC's big blogging correspondents, such as Nick Robinson and Robert Peston, will be moving over to the new format soon so the 'BBC blog' label will be significantly diminished. The BBC has always had an uneasy relationship with the word 'blog' because of its association with partial comment and opinion. Blog-like formats were often called 'logs', evident in Nick Robinson's 'Newslog' which first appeared on the BBC website in 2001 or 'diaries', like Jeremy Bowen's coverage of Gaza in 2009. In 2005, former editor of the BBC News website, Pete Clifton, temporarily banned the word 'blog' from the website until the BBC had the "tools to produce them properly". The BBC's live page updates or live text commentaries are also never officially described as 'live blogging'. Nevertheless these new Correspondent Pages unmistakably draw on the blogging format. They offer a more comprehensive stream of news for a single correspondent. The incorporation of Twitter updates means correspondents can offer more regular and shorter updates. And the pages continue a shift towards news content being organised around an individual personality as well as a news index. In effect, the personal brand is becoming increasingly important in establishing the authority of the BBC's news online. Giles Wilson notes that the BBC's decision to move news blogs from Movable Type software to the BBC's main production system enables the BBC's "top correspondents' analysis" to "feel much more like an integral part of the website." Blogging will continue to underwrite the BBC's approach to online news output even if it looks as though a first era of 'blogging' in news at the BBC is coming to an end.